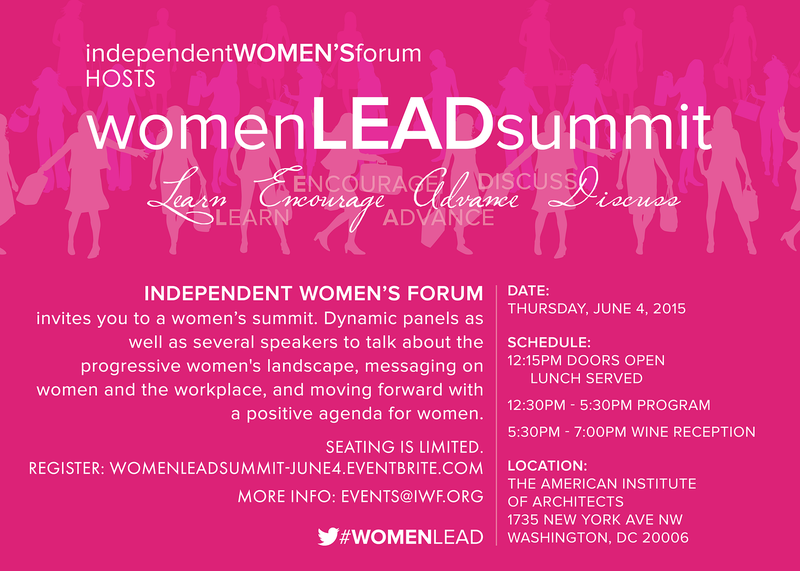 (WASHINGTON, DC) -- On Wednesday, May 13, the Independent Women's Forum (IWF) hosts Women LEAD Summit, an all-day event for right-of-center women designed to better articulate a positive agenda for women and strategize about getting this message out. "For too long progressive women’s groups have claimed to speak for women and set the agenda. They’ve told women they’re a victim class in need of constant government protection. But that message is insidious and wrong, and the IWF is excited to lead a more productive conversation with conservative women leaders about a better path forward for women and their families." From 12:30pm to 5:30pm Women LEAD Summit is packed with dynamic panels as well as several speakers to talk about the progressive women's landscape, messaging on women and the workplace, and moving forward with a positive agenda for women. LOCATION: 1735 New York Avenue, NW, Washington, D.C.